This lush private 600 acre estate borders two soft-sand Caribbean beaches with pristine coral reefs just offshore, and the property includes the historical plantation of Anse Mamin and Emerald Estate where the resort grows its own organic produce. 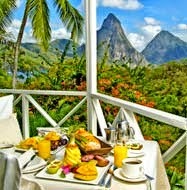 ANSE CHASTANET offers 49 extra large deluxe and premium suites and rooms - and each are individually designed. 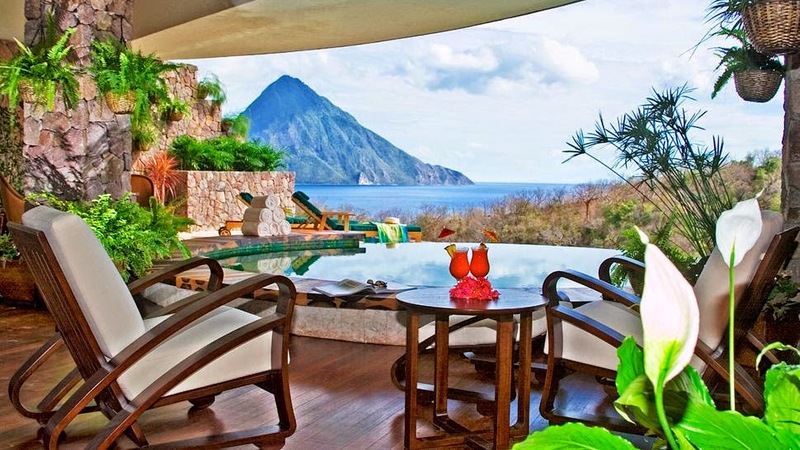 There are 12 rooms at beach level in a tropical garden, and 37 rooms are scattered on a lush hillside. Some accommodations have their 4th wall open entirely, yet are completely private. To make the most of the panoramic views and the refreshing trade winds, octagonal whitewashed cottages come with wraparound flower draped balconies and louvered windows. 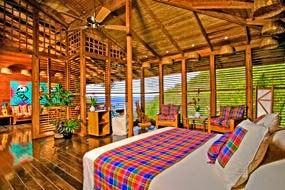 ANSE CHASTANET uses local woods and other local products in the room decor and furnishings. 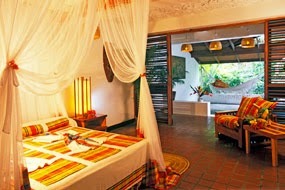 The cushions and bedspreads are made from colorful cotton fabrics called madras, the island's "national cloth. 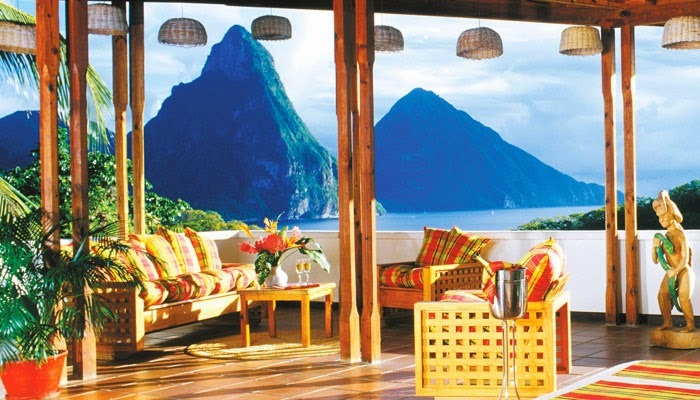 "The furniture has been individually designed and handmade in the region with the exclusive use of the island woods such as teak, mahogany, green heart, red cedar and wild breadfruit. Note: There are approximately 100 stairs leading from beach level to mid-hillside level, thus making the property unsuitable for those with walking difficulties or cardiac problems. A complimentary shuttle service from beach side to hillside level is provided any time it is requested. Facilities at the 600 acre resort include soft sand beaches, 12 miles of walking and hiking trails in the Anse Mamin valley, 3 restaurant location serving a variety of menus, 2 bars plus the Jungle Grill at Anse Mamin, an excursions and car rental desk, 2 beachside boutiques, the Kai Belte Spa, Scuba St. Lucia, a watersports center, an art gallery, library, Bike St. Lucia and now also Kayak St. Lucia. There is wi-fi available near the reception area and also computers for guest usage. Included Activities: Tennis court & equipment, snorkeling, kayaking, mini-sailing, windsurfing, use of beach chairs and beach towels, guided boat snorkel trip, scuba diving course for beginners or 2 dives for certified divers, 1/2 day Jungle Biking in Anse Mamin Valley, half day sailing on skippered resort yacht Serenity, an anniversary certificate of US$ 500 to be used on a return visit. (Unused features are not refundable). 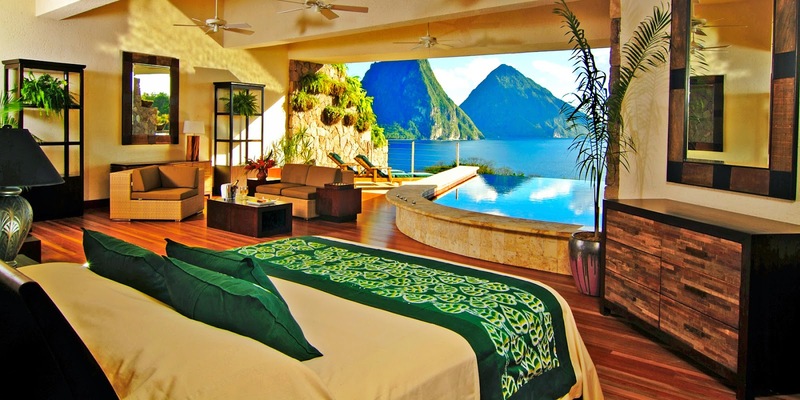 Jade Mountain is located high on Morne Chastanet, overlooking the Pitons and Caribbean Sea.